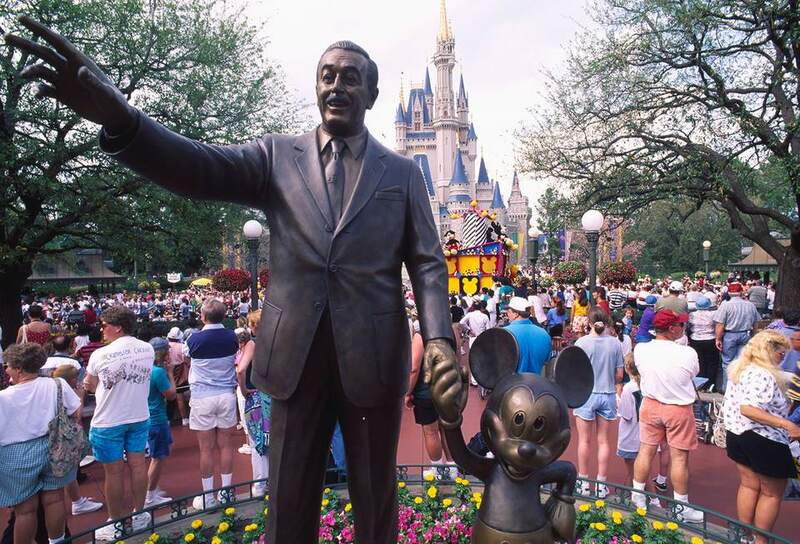 The Magic Kingdom, the first of the four theme parks at Walt Disney World Resort, opened on October 1, 1971, and quickly became one of the world's top vacation destinations. When you step through the turnstiles, you enter a storybook land filled with Disney characters ready to whisk you away to a world of fantasy and adventure. Each of the six "lands" that extend out like spokes from Cinderella's castle follows a theme, with all of the rides, restaurants, and props designed to develop the vision. Walt Disney's childhood in Marceline, Missouri, inspired this re-creation of a bustling thoroughfare in early 20th century America, complete with a horse-drawn trolley and vintage barbershop. Guests at Main Street, U.S.A., enjoy street performances by talented singers and dancers including the famous Dapper Dans Barbershop Quartet. Members perform in their trademark striped vests, bowties, and straw hats. Main Street, U.S.A., restaurants include the quick-service Casey's Corner; the Crystal Palace, with character dining; and Tony's Town Square restaurant, where you can enjoy both American and Italian cuisine. Many Disney visitors rush through Main Street, U.S.A. in an effort to get to the rides. But it's a land worth exploring, with attractions you won't see elsewhere in the park. With expert and insider tips, you can make the most of your memorable day at Disney. Celebrating a birthday? Stop at City Hall to pick up a complimentary birthday button to let cast members and other park visitors know it's your special day. Rent a wheelchair or ECV at the stand just inside the park entrance under the train station. Disney’s “True-Life Adventure” documentary films provided the spark for this exotic land of jungles and wild animals. This land contains some of the better souvenir shops in the entire park—Island Supply by Sunglass Hut is a great place to pick up new shades. Stop at the Aloha Isle quick-service restaurant for a refreshing Dole Whip or the Jungle Navigation Co. Ltd. Skipper Canteen for table service and a variety of cuisines. Adventureland appeals to older children with its slightly scarier rides, but younger kids do enjoy the jungle cruise and the Magic Carpets of Aladdin. Disney World's strong Americana theme turns to the exotic in Adventure Land, where jungles and pirates and magic carpets take you on a journey far from civilization. Look for Aladdin and Jasmine in Adventureland. Cool off on a hot day on the Pirates of the Caribbean ride; you'll feel the cool relief the minute you step into the queue. Tall tales of the Wild West come to life in this prairie outpost where cowboys and miners roam. Frontierland is Disney World's Western-themed land, and it's loaded with Tom Sawyer-esque appeal. Many of the dining options in Frontierland are themed, too, so if you're looking for tacos, burritos, or fajitas, head here. The Golden Oak Outpost and Westward Ho both serve fast American cuisine or head to Pecos Bill Tale Tall Inn and Cafe for quick-service Mexican fare. Frontierland has some of Disney World's longest-standing attractions such as the Big Thunder Mountain Railroad, which opened in 1979. Splash Mountain, a zip-a-dee-doo-dah log ride in search of ​Br'er Rabbit's "laughing place"
Popular rides in Frontierland make a good choice for the Fastpass system. Use Fastpass+ on Big Thunder Mountain Railroad and Splash Mountain to bypass the typically long lines. Visit the Country Bear Jamboree while others park-goers line up for the parade. Ride Splash Mountain when you need a sprinkle to cool you down. Step back to the age of colonial America in this land honoring the country's early heritage. A replica of the Liberty Bell greets you here. Though small and rather unassuming compared to other areas of the park, Liberty Square still deserves a visit if only to ride The Haunted Mansion, a Disney World classic. Liberty Square restaurants offer many options, though all focus on American cuisine. Try Columbia Harbour House, Liberty Square Market or Sleepy Hollow for quick service, or The Diamond Horseshoe or Liberty Tree Tavern for a more leisurely meal. You can make a quick pass through Liberty Square, the smallest of the park's six lands, but you won't want to bypass it altogether. Without a popular thrill ride, Liberty Square does not get the same attention as the park's other lands, which actually makes it a good destination when you want to escape the crowds for a while. The Hall of Presidents is a good place to sit down and cool off on a hot day. The Haunted Mansion's interactive queue makes waiting in line fun, but the spooky ride may frighten small children. Fantasyland aspires to be the happiest land of all. Fairy tales spring from storybook pages in this whimsical land of castles, princesses, and flying elephants. Jam-packed with attractions and restaurants, Fantasyland appeals to lovers of all Disney stories. The restaurants here keep with the storybook theme. You can grab a quick bite at the Cheshire Cafe, The Friar's Nook, Pinnochio Village Haus, and Storybook Treats, or sit down for a full-service meal at Cinderella's Royal Table and Be Our Guest Restaurant. Bring young children to Fantasyland, where they can live out their Disney dreams. Carry an autograph book so you can collect notes from your child's favorite Disney characters. Visit Ariel's Grotto to meet the mermaid heroine of "The Little Mermaid" throughout the day and explore her gadgets and gizmos. A rotating cast of characters stops by Fairytale Garden to meet and greet guests throughout the day. After the Mad Tea Party, characters from "Alice in Wonderland" greet guests several times each morning near the attraction. Leap into the future in this neon-lit land of rocket ships and aliens. Tomorrowland's restaurants can satisfy a space-age hunger, with Auntie Gravity's Galactic Goodies and Cool Ship for quick-service snacks, and The Lunching Pad and Tomorrowland Terrace Restaurant for a more substantial but still fast meal. Disney World's iconic roller coaster (and the oldest in the state of Florida) Space Mountain opened on January 15, 1975. No visit to Tomorrowland would be complete without a ride. The Tomorrowland Transit Authority's PeopleMover generally does not have long lines, so it makes a good ride choice when you don't feel like waiting at the other attractions. Increase your score on Buzz Lightyear's Space Ranger Spin. Sit down and relax at Carousel of Progress; it's both dark and cool inside...and one of the park's top spots for nap time.